Situated where the Eastern and Western deserts meet, Aswan is Egypt’s southernmost city. It occupies the east bank of the Nile at its widest point, and strangely, the city itself seems to emulate the river: meandering and languorous, yet incredibly picturesque. Palm trees dot the banks of the Nile and pastel-coloured houses line the shore, giving it a desert oasis feel. 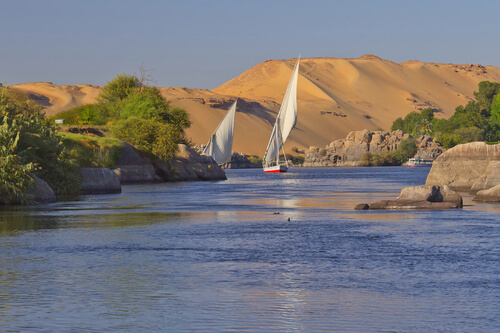 Aswan has a distinct relaxed vibe, but there’s also plenty to see and do given that it’s the gateway to some of Egypt’s most remarkable ruins and temples. In the period of antiquity, Aswan was an integral trading hub and southern border of pharaonic Egypt. Known as Swen in ancient times, the city played a vital role in not only protecting Egyptian borders but also serving as a military base and customs port in many dynasties. Perhaps the most interesting thing about Aswan is its vast stone quarries, which were ancient Egypt’s main source of Syenite, a granite rock. This material was transported across the country to build some of the most recognisable temples and monuments, including the Pyramids of Giza. Today, an enormous unfinished obelisk lies abandoned in one of the quarries and is open to the public for viewing. Had it not fractured in the centre, the obelisk would have been the largest standing stone in Egypt. Regardless of its crack, the structure gives an insight into the immense manual labor required to construct monuments before the invention of modern tools. 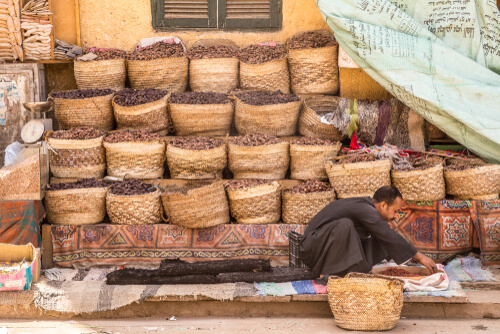 Bartering is an integral part of Egyptian culture, so tourists are invited to try their hand at shopping like a local at the souk. This vibrant bazaar sells everything from spices to tea, shisha pipes and souvenirs, and is interspersed with restaurants waiting to welcome hungry shoppers. Just outside of town, lies another must-visit, the High Dam. The dam project was established in 1960 to eliminate the annual Nile cycle of drought and flooding that occurred every year. While the construction of the project enabled control of the river, it cost a staggering one billion US dollars to complete and caused a number of new issues. For a start, the project necessitated the resettlement of almost 100,000 people, as well as the relocation of one of the largest temple complexes in the country, Abu Simbel. While still considered a controversial project almost 50 years on, the dam and subsequent Lake Nasser are great achievements of engineering.